Some people fear that UK is about to break its links with continental Europe and cut itself off permanently. 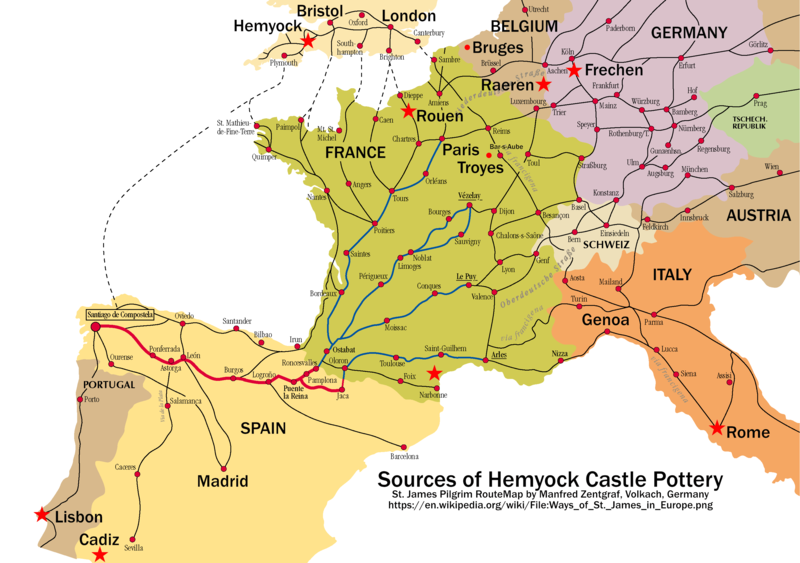 However, using pottery sherds and objects discovered at Hemyock Castle, these webpages demonstrate that the people of UK – especially of England's West Country – have always had close links with the peoples of continental Europe... official and unofficial... through ups and downs... through good and bad times. Until quite recently, overland travel between Devon and London was slow, dangerous and expensive. Despite the perils of the seas and danger from north African Barbary pirates, sea crossings to continental Europe were commonplace. Ordinary people could relate better to those in similar situations on the opposite side of the English Channel; rather than to their distant rulers in London or Paris etc. Even now, distance from government in London – especially in Summer holiday traffic – have made many West Country people more independent and more outward-looking. Regardless of any political differences, and whatever the political settlement with the EU, facts of geography mean that the people of the UK will continue their close cooperation with the peoples of continental Europe. For example: The recent so-called Scallop Wars and "Cornish crab wars" during August & September 2018, were eventually settled by agreements between the UK West Country fishermen & French fishermen; rather than by their distant governments in London, Paris, ...or Brussels. During the medieval period, there were important European manufacturing centres including in Flanders (Belgium) and Florence (Italy). There were important European markets and (trade) fairs including at Bruges (Belgium) and around Troyes (France). English raw materials & finished goods were traded through these markets & fairs; imports were bought there. 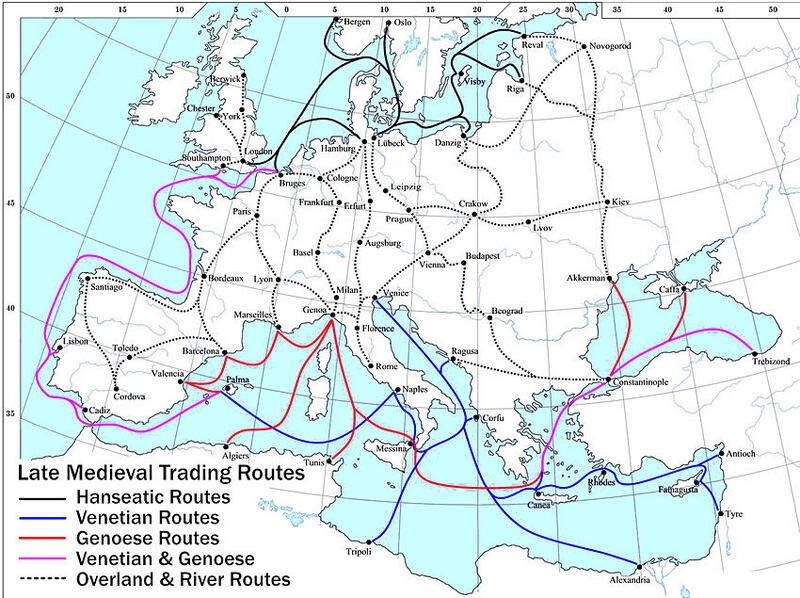 Some of this international trade followed old Roman routes or pilgrim routes. Overland routes were used mostly for compact, higher-value cargoes; despite the perils, and later the Barbary Pirates from North Africa, sea routes were used for heavier cargoes. This map shows some of the principal western trading routes across Europe and the Mediterranean during the late medieval period; about 13th to 15th centuries. Even during this period, there was also significant trade with more distant countries, by land – such as east along the "Silk Road(s)" or south through Africa – and by sea around Asia to the Far East, to Africa and later to the Americas: Before, during and after the British Empire, our trading links have not been confined only to our closest European neighbours. These webpages were created as part of a special exhibition at Hemyock Castle&apos;s 2018 Heritage Open Day. This exhibition & webpages are part of European Year of Cultural Heritage 2018 – UK is the UK&apos;s part of The European Year of Cultural Heritage 2018, a new European initiative. Heritage Open Days are part of European Heritage Days, a Council of Europe initiative. They are co-ordinated by The National Trust with funding by players of People&apos;s Postcode Lottery. Hemyock Castle receives no funding, and makes no charge for entry on Heritage Open Days. We welcome donations to The Blackdown Support Group & Musgrove Leukaemic Group Somerset. European Year of Cultural Heritage 2018 – UK. The European Year of Cultural Heritage 2018. Hemyock Castle: Heritage Open Days. A Glimpse of the Interpretation Centre.